Mum, Here is our special invitation to put yourself first this Mother’s Day. Being a mother is a tough gig. It’s a balancing act – one which you are generally at the very bottom of the priority list. As a mother, you are always looking after the whole family. You are the ultimate leader, the decision maker, the one on top of everyone’s schedule, the one ensuring the family is fed, the supreme source of nurturing. You are also the solver of household mysteries such as “Mum, I ca n’t find any matching socks”. You at the one that – probably unofficially – are in charge of keeping the ball rolling and making sure the house is still standing by the end of the day. Plus, you are not only looking after the kids and the big kid (a.k.a. your partner), you might also be looking after your ageing parents. Pause and allow yourself a chance for some ‘me-time’. It’s time to put yourself first and shed the spotlight on your health and wellbeing. As the cornerstone of the family dynamics, you need to be strong and healthy, so the structure doesn’t collapse. 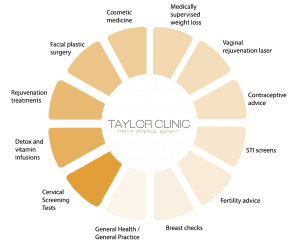 At Taylor Clinic, we can help women in many ways. Our integrative doctors undertake a holistic approach which will have you feeling better than you’ve ever been – inside and outside. Let us help you achieve a healthier version of yourself. Our team of female clinicians are here to help.